Electrical boxes for every need! 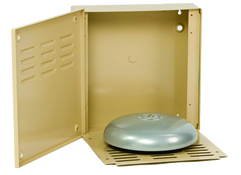 Metal or non-metallic, inside or out, Mier has a variety of electrical enclosures. 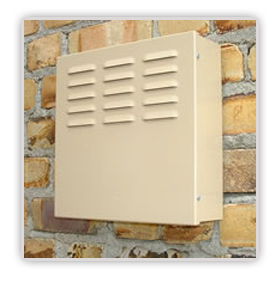 These bell boxes are used to protect your security alarms while allowing for maximum sound output. 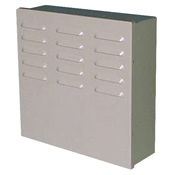 These utility boxes are made of galvannealed steel and are designed as indoor or outdoor enclosures, and different styles are available for easy installation. Scroll down to see more models and features. Scroll down to see ALL product models & features. Note: Bells are NOT included. Mier Products, Inc.’s Limited Warranty Program, for Standard Line or Custom Metal Enclosures and Parts, protects the original owner for 30 days from the date of purchase against defects in original parts or workmanship. Mier Products, Inc. agrees to repair or replace parts (Mier’s option) that are deemed defective by our Quality Control Team, without charge for parts or labor, if the defective unit is returned prepaid to Mier Products, Inc., Kokomo, IN, 46901, within the 30-day period. As metal enclosures/parts are not products containing complicated technology or electronics, close inspection at the time of receipt by the customer will quickly determine product quality. 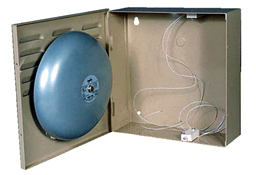 Thus, Mier Products, Inc. recommends inspection of enclosures/parts immediately upon receipt and contacting Mier Products, Inc. if quality issues arise. Mier Products, Inc. does not assume responsibility for claims or damages caused by improper installation or use of these products, accessories, and/or products connected to or stored within them. Mier Products, Inc. does not assume responsibility for damages to these products or their accessories due to shipping damage or damage occurring while in a customer’s warehouse and/or possession. These products and any accessories (including but not limited to air conditioning units, heaters, fans, filters, locks, latches, tamper switches, removable panels) must be shipped, handled, stored, and installed with strict adherence to OEM installation instructions. This warranty constitutes the entire warranty with respect to Mier’s Metal Enclosures and Metal Fabricated Parts and IS IN LIEU OF ALL OTHERS, EXPRESSED OR IMPLIED, INCLUDING ANY WARRANTY OR MERCHANTABILITY AND WARRANTY OF FITNESS FOR A PARTICULAR PURPOSE AND IN NO EVENT IS MIER PRODUCTS, INC., OR IT’S OEM PARTNERS, RESPONSIBLE FOR ANY CONSEQUENTIAL DAMAGES OF ANY NATURE WHATSOEVER. Any warranty OR sales questions should be directed to Mier Products at 800-473-0213, or via e-mail to info@mierproducts.com. Mier Products, Inc. works closely with reputable OEM Partners to offer accessories for our lines of enclosures and Drive-Alert Vehicle Detection Systems. Those accessories are warranted and supported by their OEM. As an example: Mier Products exclusively uses McLean Thermal air-conditioning units for our Temperature Controlled Enclosures. 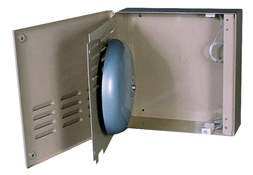 While the enclosure portion of these units is warranted by Mier Products, Inc., as written above under Metal Enclosures and Metal Fabricated Parts, the AC/Heater unit would be warranted and supported by McLean Thermal. 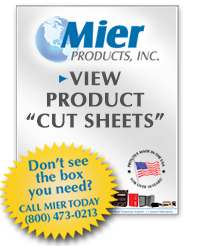 Check out our official Mier Products Catalog for models, specs, comparisons and ordering info. If we don't have it, we'll work with you to create it! We are proud of the quality products we deliver - made here in America by an experienced group of hard-working professionals for the last 30 years.